This Wikipedia and Wikimedia Commons image is from the user Chris 73 and is freely available at //commons.wikimedia.org/wiki/File:HerscherpaarMagdeburgCathedral.jpg under the creative commons cc-by-sa 3.0 license. Eadgyth had an impressive pedigree. She was the grand-daughter of Alfred the Great, daughter of Edward the Elder and half-sister of Aethelstan, all of whom were powerful kings of Wessex in England. It was only by fate she ended up as the wife of Otto I, Duke of Saxony and King of Germany. Eadgyth (also known as Edith) was born c. 911 and was the daughter of Edward the Elder, King of Wessex. Her mother was Edward’s second wife, Aelflaed. We don’t know much about Eadgyth’s early life other than a short mention about the daughters of King Edward devoting their whole attention to literature by the twelfth century chronicler William of Malmesbury. She begins to appear in the chronicles when she was in her late teens. In 929, Henry the Fowler, Duke of Saxony and King of Germany (East Francia) sent an embassy to the court of Eadgyth’s half-brother King Aethelstan at Canterbury, pursuing an alliance and a marriage for his son Otto. Henry was seeking to legitimize the Liudolfing family and to set his son Otto apart from potential noble adversaries by marrying him to a bride from a strong and well-established Saxon family. Aethelstan was carrying out an ambitious and determined foreign policy which had begun under Edward the Elder, his father. Two of Aethelstan’s sisters had already been married to men on the continent; Charles III, King of the Franks and Hugh, count of Paris and Duke of the Franks. Eadgyth and one of her younger sisters, possibly named Eadgifu, were sent to Henry’s court at Quedlinburg in Saxony, accompanied by Bishop Cenwald of Worcester in the fall of 929 and bringing gifts, treasures and their own retinue. When they arrived, Otto was given a choice between the two women. The chronicles talk of love at first sight. Of course we will never know if this is true but Otto chose Eadgyth. Otto was a seventeen year old seasoned soldier, having fought in campaigns against the Slavs and Hungarians. The couple celebrated a lavish and grand wedding ceremony in Quedlinburg either in 929 or 930 after a Saxon victory over the Slavs. Eadgyth’s sister was sent to the Alps where she married Rudolf II or Konrad the Peaceable of Burgundy (the chronicles are vague). The young couple initially traveled through the Rhineland. Although King Henry had named Otto his heir sometime between 927-9, the couple is missing from the sources until Henry died in 936. We know that Eadgyth gave birth to a son named Liudolf in 930 and a daughter named Liudgard in 931. Otto was crowned at Aachen upon his father’s death. There is no mention of Eadgyth being crowned with her husband. However, another chronicle mentions she did go through a coronation, most likely later at another location. There appears to have been some tension between Otto and Eadgyth and Otto’s mother, Mathilda. The couple took Mathilda’s dowry and she was forced to leave court and retire to her own estates in Westphalia. Mathilda, who was never crowned, may have resented Eadgyth because she was an anointed queen. Mathilda was supporting her son and Otto’s younger brother Henry during family squabbles in the 940’s causing friction. Eadgyth did intervene and reconciled Mathilda with Otto, perhaps in 941. But Mathilda did not return to court until the death of Eadgyth. While she was queen, Eadgyth worked to advance the Liudolfing family in many ways. As the mother of the heir to the throne she had an important role. She intervened in charters granting land, privileges and gifts to favored monasteries and memorials to holy women and saints. She managed the royal household and carried out her state duties. She was given Magdeburg as part of her dower and this gave her a role in east Frankish politics. Together she and her husband developed Magdeburg as the center of the family memory and a mausoleum. She maintained contacts with her sister in Burgundy and with England and her half-brothers, although details are scarce. The famous German nun Hrotsvitha of Gandersheim wrote that Eadgyth was highly esteemed for her personal qualities. She said Eadgyth had a calm demeanor, was sincere and glowed with charm. Hrotsvitha was fifteen when Eadgyth died and these are all attributes given to women who were admired in medieval times. But it shows that Eadgyth had a positive legacy in Germany. Eadgyth died unexpectedly on January 26, 946 and was buried in the cathedral in Magdeburg. 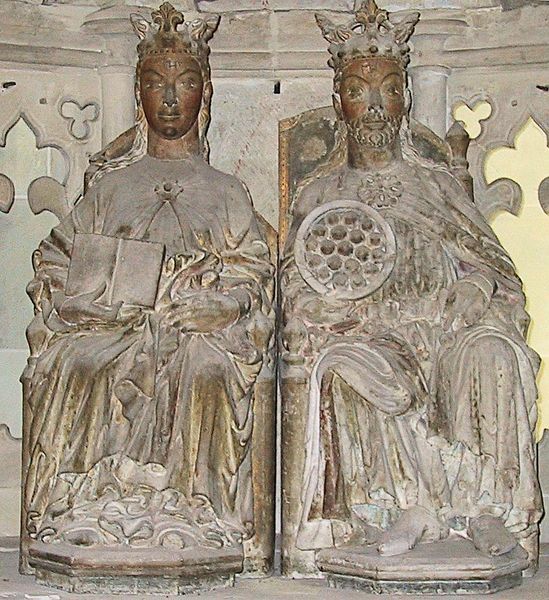 When Otto died in 973, he was buried beside her. Her death may have been a blow to her son politically. Liudolf died before his father but Eadgyth’s great-grandson became Conrad II and founder of the Salian dynasty of Holy Roman Emperors. In 2008, a tomb in Magdeburg Cathedral was found and opened. A lead coffin was inside a stone sarcophagus and there was an inscription on the tomb with the name of Eadgyth. It also said the coffin had been reburied in 1510. The remains from the tomb were examined and then brought to Bristol, England in 2010 for further testing. Isotope tests on the tooth enamel from the upper jaw of the remains were done as well as other analyses and investigations. It was determined that the woman in the coffin had spent time as a youth drinking spring water from the chalk hills in the uplands of southern England. The woman was between thirty and forty when she died making her birthdate between 906 and 916. She had a diet rich in protein, especially fish, proving she lived a high status lifestyle. Her diet appears to have been altered when she was about nine years old and it is speculated she may have gone to live in a nunnery with her mother who most likely was repudiated by Edward the Elder so he could marry his third wife Eadgifu. Stress markers on her bones revealed she might have had some kind of infectious illness between the ages of ten and fourteen. Everything confirmed the remains to be those of Eadgyth and they were re-interred in Magdeburg Cathedral on October 22, 2010. That looks very interesting Hans. I find it so interesting all the information of there lifestyle. To live and love and have family problems, raise your children . Hundreds of years later know what you had eaten as a child. Thank you, I am enjoying this series of Early Medieval and Anglo-Saxon Queens. This is very interesting! It’s fascinating what they can deduce now from the examination of remains such as teeth. Again, I would love to have seen Eadgyth – time travel would be so good. Those statues rather freak me out, however! HaHaHa! I know what you mean about the statue Jo. If you ever figure out how to time travel, I’ll be happy to go with you! And the archaeology is VERY interesting. A very interesting addition to my scarce knowledge of that particular time frame. Thanks so much. Very Very interesting, I was looking for the word in the dictionary isotope, and its mean roots, the test they made from the tooth, well they eat a lot of roots !! I like this post !! !